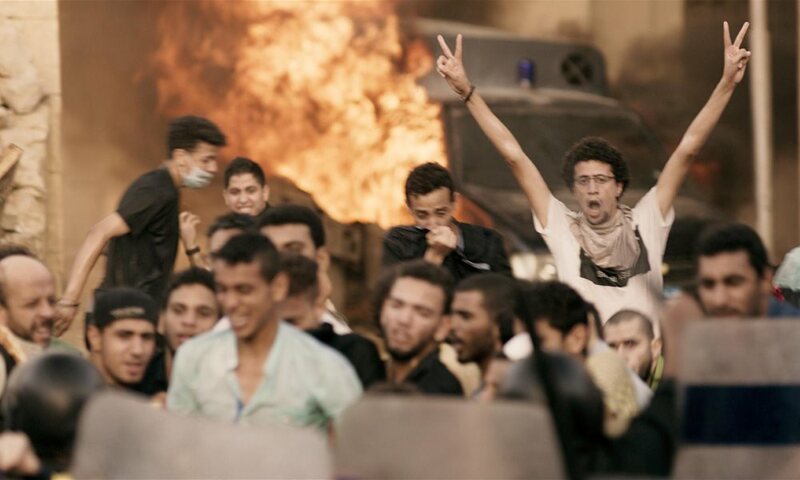 Chief in the accomplishments of Mohamed Diab’s hard-hitting sophomore feature Clash is the director’s decision to conduct, and construct to astonishing effect, his entire film from the back of a police van. Perhaps eight foot wide and a dozen paces long, this metal cage is our home for the duration. It, and the people within it, form a microcosm for the Egyptian director’s keen inspection of his nation in the aftermath of the Arab Spring and its unstable, bitter fragmentation during the Muslim Brotherhood’s resurgence. Taking place over the course of a little less than 24 hours, it is day-in-the-life cinema at its most pertinent. With a sense of every man for himself and out for another, Clash immediately bristles with urgency and the threat of violence. Two Associated Press journalists are relieved of their cameras by police and thrown in the back of the truck. Cinematographer Ahmed Gabr’s own camera captures each and every moment in such an immersive fashion that we are cheek by jowl with those on screen as this space becomes increasingly more crowded. Shaky, frequently blurred and dizzying framing replicates the disorienting sensation of being imprisoned at such close quarters, and without cause. The confinement of the van is restrictive and claustrophobic but it also provides a safe haven from swarms of protesters. This knife edge of vulnerability and protection is superbly well crafted by Diab and just as there is the idea of ‘us’ and ‘them’ in the devastated streets we see through barred windows, a line in the sand is drawn between warring factions within in it by those pro and anti-Muslim Brotherhood. But for two members of their midst the group unanimously agree on journalists as liars and traitors but using an Apple watch American-Egyptian Adam (Hany Adel) records their struggle for the world at large. He maintains that such footage must be seen by all [read: uncaring Westerners] and the same should be said for Diab’s film. Dissenting voices, points of view and political motivations cause tempers to boil over within the van. But when an old man and young girl are denied the right to use a toilet and a water cannon is fired in through the open door at all occupants of the space, a tide of togetherness begins to swell. The sound of bullets ripping through metal is utterly terrifying and in the face of such peril the group moves towards a supportive, protective solidarity; discussing football, sharing anecdotes and unifying their efforts to break free the shackles of injustice. Moving to night-time, a hellish blur of green laser pointers, fireworks thrown as projectiles, and a cacophony of shouts and cries, Clash builds to a climax worthy of its name. “This is one such day,” says onscreen text in the film’s opening moments: this may be one drop in an ocean of stories, but the ripples of Diab’s film make towering waves.